Beauty has been defined in countless of ways and continues to have varied meaning and significance to each and everyone of us. If you ask me, there is a similarity in all these descriptions and this is how beauty is not just limited to how you physically look but it also comes from who you truly are as a person. Being in a world of growing standards, labels and comparison we can’t help but be in a constant struggle of actually feeling beautiful (unless someone tells us so). Today, I want to share with you guys an open letter on beauty while also reminding you guys of how beautiful you are cause honestly… it isn’t just limited to anyone. We were all born with it since the very start but we seem to forget it all the time. Hey you! Yes, you! You know what? You are beautiful. No matter what race, size, color, status or nationality you have, you're one in a million. Your smile, laugh, voice… perfection! Even the way you talk, sit, stand, or even stare makes you different-unique from all. Don’t ever put yourself down cause you are authentic in your own way. Don’t let flaws inside and out define who you are because these exist to bring out the natural beauty you’ve had since the day you were born. I understand that there are days when everything doesn’t go your way. You may cry because of the trouble and problems you’re facing. You may eat loads because that’s where you find comfort in sad days. You may hurt your own ego because of the standards you constantly face with. You may go through a shiz load of challenges but I mean come on. That’s life. There are ups and even downs. There’s a balance of the good and bad. It’s a matter of not making this affect who you are because being your true self makes you stand out, a true beaut to one and all. You have your own goals, dreams and passions. You have your own interests, likes and hobbies. You are you and no one else. You’re one out of thousands in the world. Wherever you are and whatever you do, beauty is everything about you. 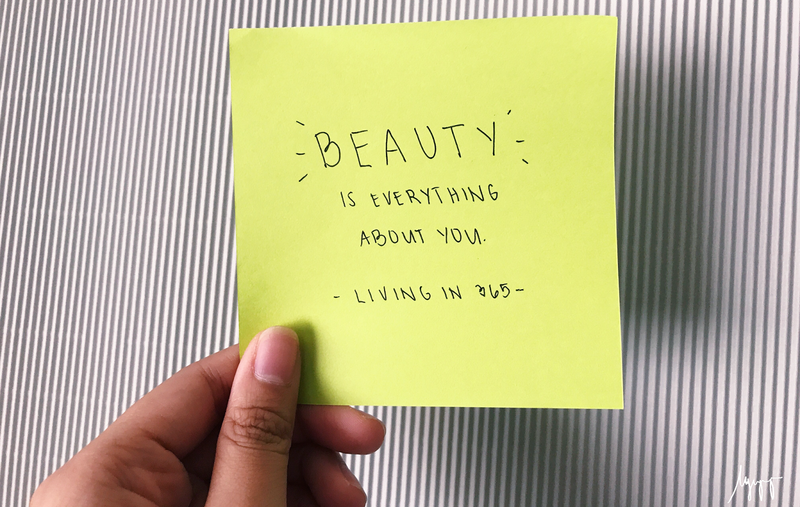 From head to toe, in and out, what you do and how you do things-- you’re beautiful no matter what. We can all testify to that. So you, how do you define beauty? Let’s remind others of how beautiful they are. Don’t hesitate to share with us your thoughts below.